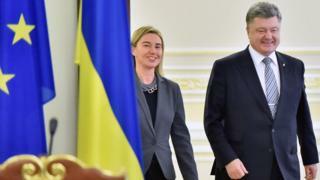 Ukraine's President Petro Poroshenko says the EU has confirmed that an EU-Ukrainian free trade zone will be launched on 1 January. The deal was supposed to take effect this January but Russia objected. Political tensions escalated into violence in Ukraine after former President Viktor Yanukovych backed away from the agreement with the EU in 2013. There has been more sporadic shelling in eastern Ukraine. Russia remains opposed to EU-Ukrainian integration. Ukrainian government forces say pro-Russian rebels in the east fired heavy guns and mortars repeatedly at several villages near rebel-held Donetsk on Monday. The statement also said the rebels had fired 12 Grad rockets at the outskirts of Krasnohorivka and Hirnyk - towns just west of Donetsk. The rebel "Donetsk People's Republic" meanwhile said several rebel positions had come under mortar and machine-gun fire from government troops. There were few violations of the ceasefire in the east in September and October, but this month has seen more shooting. In a tweet, President Poroshenko said the "EU just informed us that all is ready to launch a free trade zone with Ukraine as of Jan. 1, 2016". On a visit to Kiev last week, EU Trade Commissioner Cecilia Malmstroem said that, once implemented, the EU-Ukraine Deep and Comprehensive Free Trade Area (DCFTA) would "send a powerful signal that the regulatory environment in Ukraine is modern and efficient". But the EU is boycotting all trade with Crimea, the Ukrainian peninsula annexed by Russian troops in March 2014. The DCFTA requires Ukraine to meet EU standards in many economic policy areas, including competition, public procurement and intellectual property rights. Reforms have been slow to take root in Ukraine, as cronyism and corruption have plagued its politics and economic management for years. If Ukraine sticks to the DCFTA conditions the EU will gradually remove tariffs and other barriers. The EU is Ukraine's biggest trade partner - more than one-third of its trade is with the 28-nation bloc. However, Ukraine relies heavily on Russia for oil and gas. Many Ukrainian enterprises - especially in the mainly Russian-speaking east - maintained close links with Russia after the Soviet Union's collapse in 1991. Last week Ukraine's parliament passed a law banning discrimination in the workplace - part of a package of reforms demanded by the EU as a condition for granting Ukrainians visa-free travel.